This 2018, Cherry Mobile is celebrating the 9th year of their longest annual campaign, the Cherry Mobile Festival. And, this time around, they up the ante for their loyal customers with lots of surprises, new phones, great discounts, and a chance to visit three Southeast Asian countries namely Malaysia, Indonesia, and Thailand. 1. (Grand Prize) One (1) winner of an Asian Cruise for 5 Days and 4 Nights to Malaysia, Indonesia and Thailand. The winner is entitled to bring two (2) Companions. 2. (Major Prize) Three (3) winners of an Asian Cruise for 5 Days and 4 Nights to Malaysia, Indonesia and Thailand. Each winner is entitled to bring one (1) companion. 3. 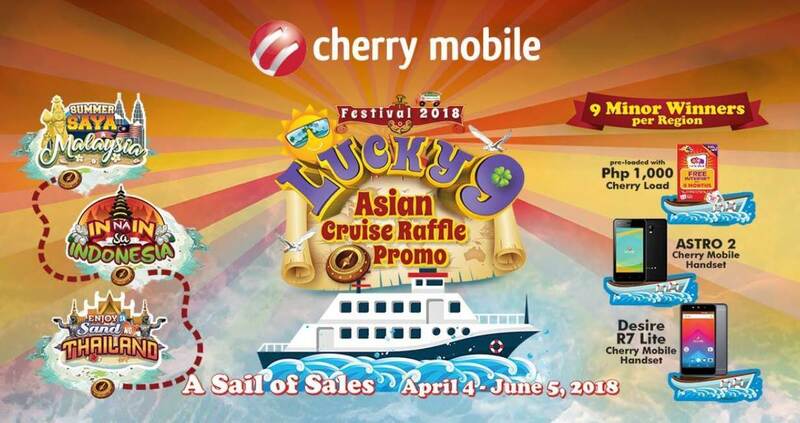 (Minor Prize) Nine (9) winners per region of Cherry Prepaid SIM with Php1000 load, Cherry Mobile Astro 2 worth Php1,699, and Cherry Mobile Desire R7 Lite worth Php2,699. In order to qualify for the raffle, customer must purchase a Cherry Mobile phone worth Php2000 and up. The promo period is until June 5, 2018, and the raffle draw will be held on June 19.